Do you have plans next weekend? If not, you’ll want to clear your schedule from Friday to Sunday, Feb. 1-3 for the War Heritage Days celebration at Fort Zachary Taylor. 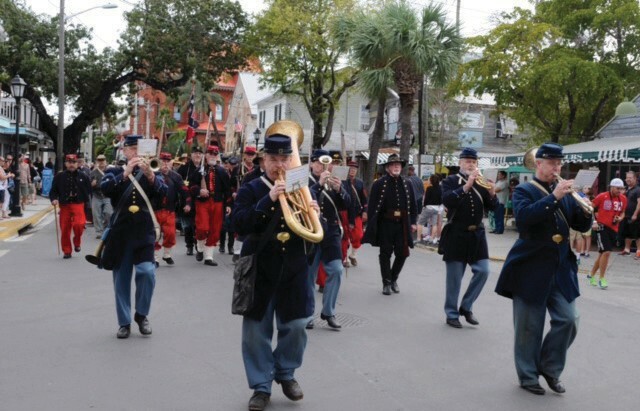 Now in its 33rd year, Civil War Heritage Days is one of the unique annual events in Key West. That’s saying a lot on an island as extraordinary as this. 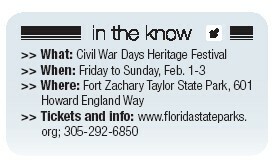 Beginning at 8 a.m. Friday, Fort Zachary Taylor Historic State Park will be transformed into a Civil War federal encampment, complete with a field full of costumed re-enactors waiting to transport festival-goers back to a time when the town became the only city below the Mason-Dixon line to remain loyal to the Union throughout the war. The story goes that on the evening of Florida’s secession, federal soldiers, sensing the potential of retaining a deep-water port close to enemy supply lines, seized Fort Zachary Taylor as the headquarters of the Navy’s East Gulf Coast Blockading Squadron. Fort Zachary Taylor, with its towering walls, sanitation facilities, impressive artillery and prime location at the mouth of the Florida Straits, was the glittering jewel of Florida’s seaside forts. At the time, the fort was only accessible by a 1,200-foot causeway, and appeared to passersby as a menacing island in and of itself. It was the perfect stronghold for Union soldiers, who would rely on its prime location and its 200 cannons to intercept enemy supply ships before they reached land. 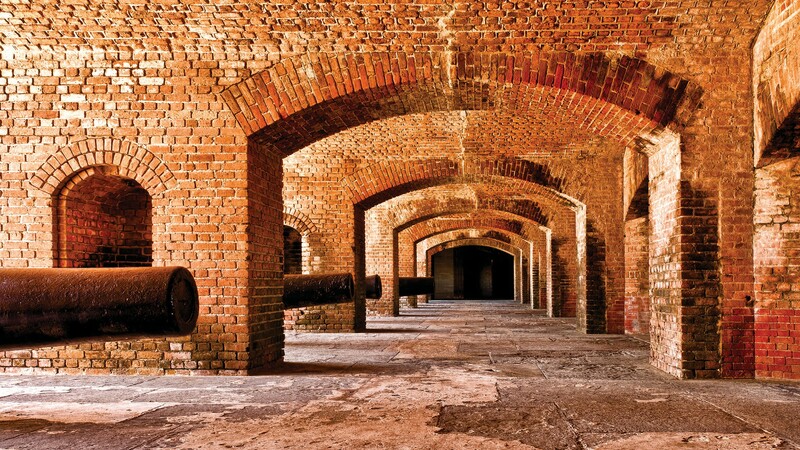 Designated a National Historic Landmark in 1973, today’s Fort Zach is a better place to spot tourists wielding selfie sticks than blockading ships carrying ammunition — except during Civil War Heritage Days, when the fort and the surrounding areas are transformed into a bustling, circa-1861 community of Union and Confederate infantrymen, craftsmen, settlers and townspeople. It’s a lively three days, complete with a parade down Duval Street, dedicated school children’s day, weapons demonstrations and a variety of reenactments. There’s even a faux sea battle and blockade-runner’s trial scheduled, as well as a series of lectures by Edward England, whose late father, Howard England, was the preeminent authority on Fort Zachary Taylor and who championed its transformation from ruin to historic landmark. Event coordinator and park services specialist Kevin Bowes is effusive about the historic and rare opportunities the Civil War Heritage Days celebration offers. 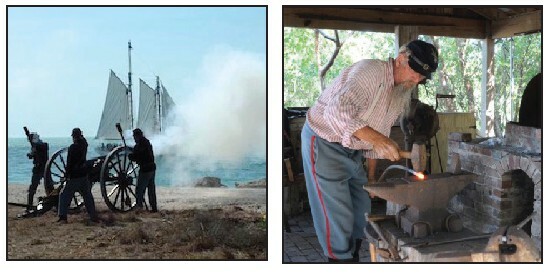 Outside the Civil War Heritage Days celebration, Fort Zach and the surrounding state park remain one of Key West’s most popular attractions. It’s wonderfully haunted, say those who believe in that sort of thing, and it’s one of the best places on the island to take in a view of the open sea. Other Heritage days events include battle re-enactments, right, and crafts demonstrations, far right. But this weekend, with about 100 uniformed Union and Confederate re-enactors strolling around, you’re all but guaranteed a free tour guide, with a literal army standing by to help you brush up on the history of America’s most bloody conflict to date. Civil War historians like to point out that outside the walls of Fort Zachary, Key West townspeople were largely sympathetic to their Confederate neighbors. But Kevin says the Heritage Days festival does not make a big deal about the historical rift. Along with gaining a better appreciation for a Civil War soldier’s daily experiences, guests will be able to purchase period merchandise from vendors. Those with children are encouraged to pay special attention to Friday’s “School Day” event lineup, which includes a cannon-laden parade down Duval Street and demonstrations for kids. More than 500 local fifth and eighth graders are scheduled to attend. Kids can learn how to cook over a campfire, play a dulcimer, navigate using the stars, sew a quilt and more. Kevin says the hands-on approach to historical education is such good fun, students often return to serve as reenactors. Indeed, there is something to be said for the immediacy and theatricality of historical reenactment at a time when so many of us communicate through the distorted, alienating lens of social media. The parallels between our country’s division 150 years ago and today make it obvious that history is both cyclical and corrective. With our national consciousness positioned once again at the crux of either a reckoning or a reset, so much depends on our collective ability to understand how we got here and how our past continues to inform our future.